The tantalisingly broad criteria of the Deutsche Börse Photography Prize never fails to kindle an eclectic catalogue of artistic endeavours. This year brings together adolescent memories of reckless hedonism, war torn landscapes and an unobtrusive hummingbird in mid-flight. 1. Alberto García-Alix‘s publication Autorretrato/Selfportrait. As much as Garcia-Alix’s collection of black and white self-portraits documents his own story, it tells also of the generation to which he belonged; a generation whose adolescence began in a moment of unrestrained, intoxicating liberation, unrestrained in the new post-Franco era. His earlier self-portraits capture the defiant recklessness that came with his narcotized, ‘living in the moment’ agenda. His unabashed vanity and exaggerated poses place the camera as a vehicle with which identity is created; mystical, fictitious and defined by scandalous hedonism. “I took shots of my possessions, my vices and the street corners where I hung out, because I wanted to elevate them to epic status.” Through his documentation, this self-created form of identity is transformed from youthful fantasy into a matured, reflective reality of how things were. His later self-portraits take on a calmer, perhaps more refined, inquisitiveness. No longer about his disreputable exploits, these images isolate his lone figure to the frame. In a newfound awareness, he struggles to understand this mature self, left behind in the unforeseen hangover of a generation inflicted with the consequences accrued from a life of reckless excesses. 2. Lorna Simpson‘s exhibition Lorna Simpson (Retrospective) at Jeu de Paume, Paris. 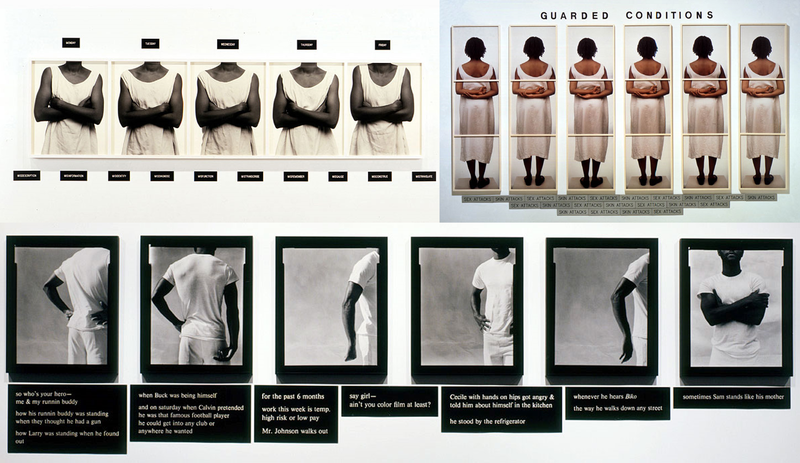 In an ambiguous union of image and text, Simpson’s work evokes the viewer’s active interrogation of gender, race, memory and body, transforming us from bystanders to participants in her questioning of the way in which identity is constructed. Confronted with a restricted, incomplete vision of her subjects, the crucial role of the face as a mark of identification is highlighted. Our impulse to decipher from it meaning and understanding of otherness is disrupted, and the accompanying, half-finished narrations offer no guidance. Denied the expected, we are prevented from lapsing into habitual, passive interpretation, encouraged instead towards active reflection in order to complete the fragments. Attention is drawn to ourselves as we take on the role of creator, our interpretations based on our own beliefs, experiences and imagination. This unexpected exercise of self-reflection demands that we question the way we instinctively approach identity, race and gender. Any latent stereotypes and discriminations towards the individuals that the viewer may hold are shatteringly unearthed. 3. Jochen Lempert‘s exhibition Jochen Lempert at Hamburger Kunsthalle. 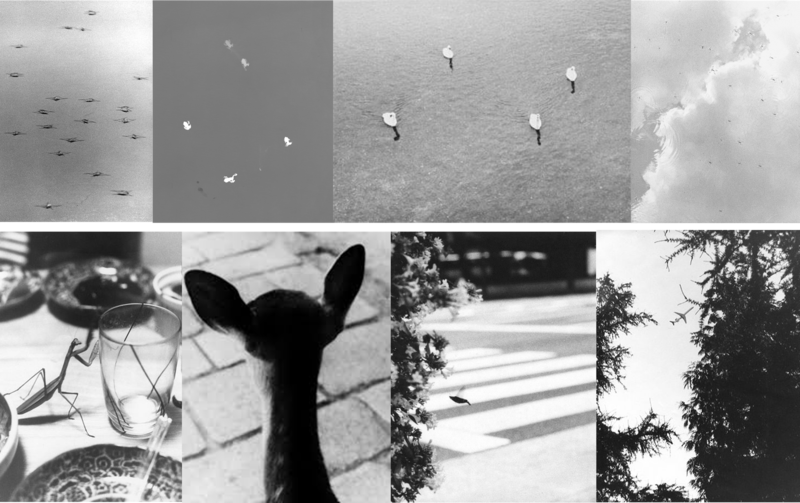 An installation of black and white images depicting commonplace occurrences within the natural world, Lempert’s work emerges as a paradoxical fusion of scientific archiving and artistic abstraction. Originally trained as a biologist, lingering elements of scientific documentation become submerged in an intriguing absence of clarity. By isolating ambiguous patterns, obscure shapes and fragments of subjects, Lempert embeds every day, often unnoticed, visions with subtle curiosities. The serenity of the natural world is presented as a case for wonder, worthy of artistic contemplation. In some images, fragments of civilisation can be seen amidst the natural world, triggering reflection on the relationship between the two. During the exhibition, the windows of the Hamburger Kunsthalle were re-exposed for the first time since 1996, literally opening up the inside to the outside world, and serving as an aptly provocative environment with which to consider Lempert’s work. 4. 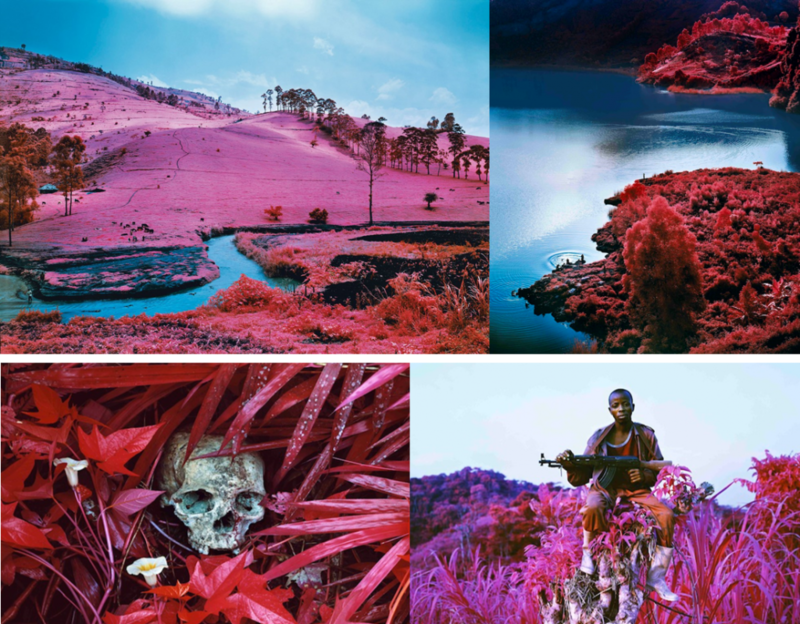 Richard Mosse’s exhibition The Enclave at Venice Biennale, Irish Pavilion. In a series of flaming, rose-tinted landscapes, Mosse documents the ongoing war between rebel factions and the national army in the Democratic Republic of Congo; a conflict largely unreported in mainstream media despite its staggering fatalities. The winner will be announced at a special ceremony at The Photographers’ Gallery on 12 May 2014. Next articlephotographyAnd what of Nature Photography?